When you have a newborn baby, your waistline may be the last thing on your mind. Yet women often feel pressured to lose their "baby weight" as quickly as they can after pregnancy. It's completely normal to have some weight left over at the end of pregnancy. This is due to the change in body composition to support the pregnancy. Bouncing back to your pre-pregnancy weight immediately after giving birth is neither realistic nor recommended. Instead, taking a balanced approach to weight loss over several months will optimise a woman's future health outcomes. Achieving a healthy weight after having a baby is also important if you're planning on another in the future. Each woman's weight loss experience will be slightly different. Most studies show women retain about 1-5.5 kilograms at 6-12 months after pregnancy. In our study we found three out of every four women retained some of their pregnancy weight six months after the birth, and one in three retained more than 5 kgs. A few weeks after having your baby, this will generally include some extra fat tissue and breast tissue. Having some stored fat tissue at the end of pregnancy is nature's way of making sure mothers have enough stored energy to support breastfeeding. 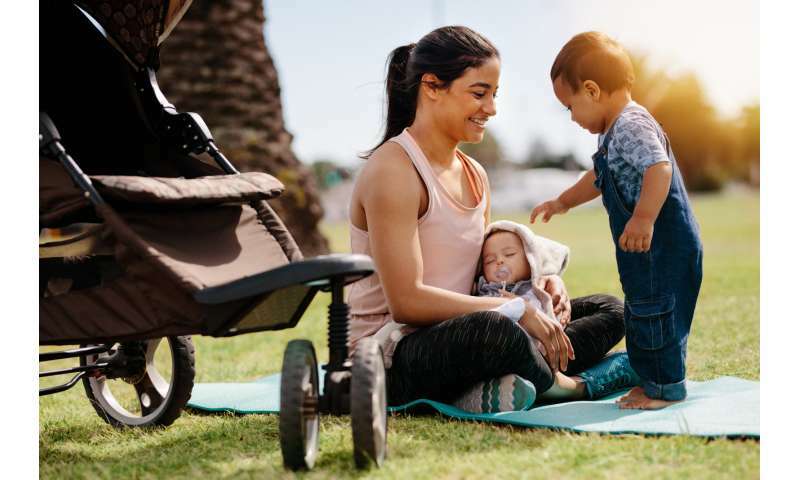 Losing this extra store of body fat in the first year following childbirth will help improve a woman's future health trajectory. Be active. Exercise can help improve both mental and physical health after pregnancy. It can improve sleep, help reduce fatigue, improve your fitness and help you return to your pre-pregnancy weight. Aim for 150 minutes of moderate intensity aerobic exercise per week. Begin by building up ten minute bursts of activity at a time. Start with slow, short and gentle exercise after childbirth, like walking, and gradually increase your duration, speed and intensity. It's important to discuss returning to exercise after pregnancy with your doctor. Breastfeeding may help. When your body produces breast milk, it uses energy (around 2,620 kJ per day), which can come from the fat tissue stored during pregnancy, as well as the energy from food and drink you consume. Breastfeeding may help with weight loss, although it's normal to feel more hungry when you're breastfeeding. The key is to mostly eat healthy foods so your body then has to draw on its energy stores. Breastfeeding has lots of other benefits for you and your baby, so getting the support you need is important. Start a conversation with your doctor. They can provide you with advice and support around weight loss, mental health and overall well-being in the period following your baby's birth. They can also refer you to a dietitian or exercise specialist for individual nutrition and exercise support. I didn't start losing until 4 months PP even though I started working out at 6weeks. At 4 months I cut out junk food, started drinking Mummy magic weight loss tea and did HIIT for 30 min a day/5 days a week. Lost all 40 lbs I gained while preg. I just blow up when preg.